Orogenesis refers to the way mountains formed, by extrusion and folding. The longest and highest mountain range is under the oceans. It encircles the globe and connects back on itself. The underseas range straddles (and was formed by) a global expansion seam that runs through every ocean. This image of how undersea mountains formed as lava wells up into the seam is in the public domain from the United States Geological Survey, an agency of the United States Department of the Interior. See USGS copyright policy. The expansion seam is active, periodically spitting out basaltic lava. Except for continental margins and a few tabletop shallows, undersea mountains are made of dense basalt, not the lighter granites found in the basements of the continents. Continental mountain ranges encircle the Pacific and continue along a chain of islands off the Coast of Asia. Another ring of mountains encircles western China, extending to Siberia. Mountain ranges also run from Europe to India. What caused continental mountains? Tony Lowry and Marta Perez-Gussinye used earthquakes to compare seismic velocities for the two kinds of continental basements, plains and mountains. They claim that a low seismic velocity ratio for mountain basements suggests that the foundations of mountains are rich in quartz. The quartz belts seem to be absent from the flat plains. This suggests that continental mountains pushed up in weakened areas where the basement rocks were fractured by water-deposited quartz seams. Quartz forms in hot water loaded with dissolved silicon, such as in a hydrothermal vent. 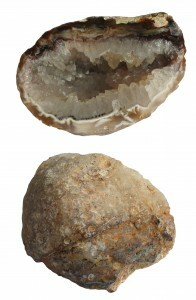 A geode is a hollow place in a rock that was once filled with silicon rich water. The crystals condensed on the insides of the hollow. The photo of a cut geode is under a GNU free documentation license by Manfred Heyde. According to Psalm 90:2, the mountains were born in antiquity. Habakkuk 3:6 says God continues to scatter the ancient mountains . Psalm 65:6, says it was by God’s strength the mountains continue to be made firm. Job 28:9 suggests that the base of the mountains are flint. The Bible does not mention mountains until the cataclysm. Let’s review biblical creation! First Elohim creates (completed action) the plural heavens and earth (the entire universe). However, at that stage the Earth is (completion verb) unformed. Elohim’s wind dithers in unbroken continuity above the dark, unformed face of the Earth as He continued to command light to continue to be. To this day, light dithers around within atoms, giving them extension. Only about 1/10,000th of an atom seems to be active things. The rest seems to be largely empty space. By the second day, the earth is covered with water. Then Elohim continued to command an expanding atmosphere (raqiya shamayim) to separate waters below from waters above. A similar process is going on today on a moon of Saturn: Enceladus where emerging gases and water jets are forming an ice ring and a thin atmosphere . Earth’s leading hemisphere plows into twenty house sized dirty snowballs every minute. Spacecraft have photographed the UV absorbing streaks as these ~100 ton snowballs fall into our atmosphere. Evidently some of the water that was separated above the spreading atmosphere on day two, is still returning to Earth. This view of three Enceladus water jets spreading out into space and forming an ice ring is from NASA. On day three, Elohim continued to command the waters to be gathered into one place. 2 Peter 3:5 “For when they maintain this, (that all things remain the same – verse 4) it escapes their notice that by the word of God the (plural) heavens existed long ago and the earth was formed out of water and by water.” Peter states that the solid part of the globe (ge) stood out (ek) from the water. Ek is the point of origin from which something comes out. In porous ground, water seeps down into subterranean aquifers. If it is warm and acidic, it eats out cavities in the rock where quartz crystals grow. Quartz veins are evidence that the primordial Earth was once submerged in mineral laden water. Why don’t modern oceans seep underground? Modern oceans are slightly alkaline, not acidic. They are also imprisoned by dense, impervious, basaltic seafloors. Genesis chapter two informs that it did not rain in Eden. Instead rivers flowed around the land watering the face of the earth. During the cataclysm the underground seas (Hebrew tehom) burst forth. It was then that: Job 38:10-11 “I placed boundaries on it And set a bolt and doors, And I said, Thus far you shall come, but no farther; And here shall your proud waves stop?” During the cataclysm mountains uplifted and the waters ran down into wide valleys. Psalms 104:6-9 “You covered it with the deep as with a garment; the waters were standing above the mountains. At Your rebuke they fled, at the sound of your thunder they hurried away. The mountains rose; the (wide) valleys sank down to the place which you established for them. You set a boundary that they may not pass over, so that they will not return to cover the earth.” Tiny crystals that formed when basalt hardened in the bottom of the oceans show that the Atlantic did not exists when the Mediterranean and Pacific began to spread out. How can we verify biblical earth history? In the Hebrew text of Psalm 136:6, God continues in unbroken continuity to spread out the Earth above the waters. Indeed, the continents only fit together on a tiny globe without major seas and the oceans are indeed younger than the continents. The Bible states three times that the Earth stretches out in unbroken continuity. New sea floor is continually forming along the undersea expansion seam. This is gif is from Michael Netzer showing how the Earth continues to grow as new seas form. The best way to understand mountain building is to accept the biblical descriptions of a growing Earth. It is as the Earth’s crust is gradually stretched (and also by solar system catastrophes) that mountains are upthrust through weak areas in the continental basements. What about the mountain ranges in the ocean? They extruded as a global crack is pulled apart by the continually growing Earth. What causes a growing Earth? According to the Hebrew grammar of Zechariah 12:1, God continues, in unbroken continuity, to lay the foundations of the Earth. Remember that He continues to command light to continue to be, according to Genesis 1:2. Light dithering around within matter, gives it extension. Someone might claim that He finished creating the heavens and the Earth by the seventh day. The verbs for finished in Genesis 2:1-2 are imperfect, showing that the intensity of creation finished even as it continues. Perhaps the core of the Earth still has a great deal of unformed matter that is continuing to receive form as God continues to command light to be. According to Isaiah 42:5, the Lord continues in unbroken continuity to spread out the earth and its offspring, that which is born (or emerges) from the Earth. Perhaps mountains were thrust up in the areas weakened by quartz that formed when all Earth’s seas were underground and rivers flowed around the single continent. 2 Peter 3:5-6 tells us that the water was “standing with the land” before the cataclysm (down washing) that destroyed the primordial Earth. During the geological eons from Creation to the flood, Earth’s waters were largely underground or in space in the form of ice (Proverbs 8:28). It was after the breakup of the subterranean seas that the mountains uplifted. Of course these things make little sense to a person trained in western thinking. Western earth-histories depend on an assumption, the idea the Bible predicted for the last days, “that all things remain the same.” Western people have a linear view of history. Yet we can see the past with telescopes to near the creation. Atomic clocks in the past visibly shone at tiny fractions of the frequencies of modern atoms. The most powerful evidence for the literal creation is how the galaxies spread out, often growing into huge, local, dusty growth spirals. How did they grow? From the unformed matter in the core of each galaxy. The atomic clocks and the outward moving stars streams accelerate together as billions of galaxies intrinsically grew.